Gelato is the Italian version of ice cream, and it differs from American ice cream in a few fundamental ways: its denseness, its sugar content, and its temperature. It contains significantly less butterfat than ordinary ice cream. Whereas ice cream might be 15 percent butterfat or more, gelato typically contains more like four to eight percent butterfat. 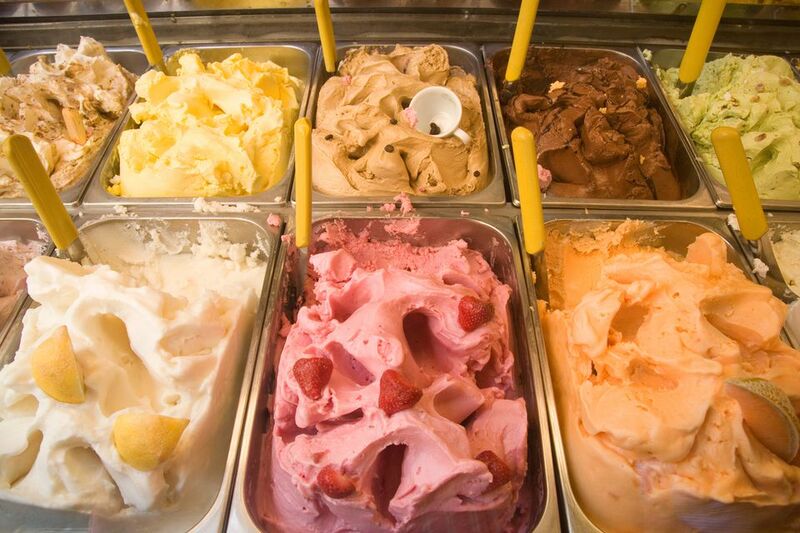 Gelato is churned more slowly and has less air whipped into it than ice cream, thus producing a denser product. Gelato differs from ice cream in another respect, which has to do with how much sugar it contains, with gelato having perhaps 10 percent higher sugar content. Other than that, gelato and ice cream share the basic attributes of being made from frozen milk, cream, and other ingredients, sometimes including egg yolks. Since gelato is denser, its flavor can be more intense than ice cream. Finally, gelato is generally stored and served at warmer temperatures than ice cream. Whereas ice cream can be stored in a deep-freeze of -20°F or colder, gelato is usually stored at 0° to 10°F, and served at 10° to 20°F. Gelato's lower fat content and denser consistency would make it too hard to eat at colder temperatures. Here's an ice cream maker that has a setting for gelato, to ensure it's mixed to the proper consistency. So, a couple of things are happening here. One, the lower temperature means you taste the flavors more intensely. This is due in part to the fact that a numb tongue is less sensitive. Also, there are receptors in our taste buds that are more sensitive when the temperature of the food is increased. This is particularly true of sweet flavors. If you've ever noticed that melted ice cream tastes sweeter then when it's still frozen, that's what's happening. Another factor is that the flavor compounds that produce aromas (which in turn affect the way we experience flavor) are more volatile at warmer temperatures, so when food is colder, its flavor will be correspondingly less intense. Take tomatoes, for example. Tomatoes are known to be less flavorful when they're chilled. That's because the enzymes that produce its flavors and aromas are switched off when it's chilled. Somewhere, somebody is undoubtedly making a tomato gelato, and the tomato flavor will be more intense the warmer it's served. Finally, ice cream is made with cream, which has a higher fat content than milk, and fat tends to coat the tongue which forms a barrier between your taste buds and the food. Since gelato is made with milk, there's less fat present, so you taste the flavors more intensely.